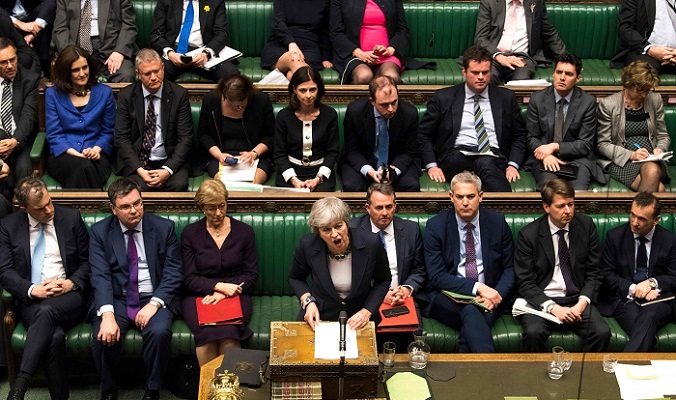 British MPs voted to reject a no-deal Brexit on Wednesday, prompting Prime Minister Theresa May to announce she will put her EU divorce plan to parliament for a third time in the coming days. She was speaking after MPs voted to rule out a "no deal" departure on March 29 -- two days after they also rejected her own divorce terms. Addressing the House of Commons, May said the "logical consequence" of the votes was for MPs now to decide if they wanted to postpone Brexit. But she said the EU would only support a short delay if MPs agreed her deal -- without that, "there will need to be a much longer extension". "I do not think that would be the right outcome. But the house needs to face up to the consequences of the decisions it has taken," she said. The no-deal vote was largely symbolic as Britain is still on course to leave the EU in just over two weeks, unless it can agree a new plan or delay which would require the unanimous consent of all EU leaders. MPs on Tuesday rejected May's deal for a second time, raising the risk of severing 46 years of UK-EU ties overnight and causing an economic shock on both sides of the Channel. Catherine McGuinness, policy chief for the City of London financial district, said British business was "staring down the precipice". The impasse in London has also caused huge frustration in Brussels, and EU leaders have now warned they cannot agree a delay until MPs say what they want. "Why would we prolong the negotiation? To do what?" EU chief negotiator Michel Barnier told the European Parliament in Strasbourg ahead of the vote in London. May's decision to bring back a deal that critics said was "dead" is likely to prompt fury among many MPs. But a spokeswoman for the European Commission said: "There are only two ways to leave the EU: with or without a deal. The EU is prepared for both. The "no deal" vote emphasised May's lack of control over events. She had offered MPs a vote against a "no deal" option after they rejected her plan on Tuesday, but her proposal made clear this remained the default option. MPs opted to instead back an amendment ruling out "no deal" in all circumstances. The pound took a brief knock after MPs rejected May's divorce deal for a second time on Tuesday, but rallied on hopes that MPs would now vote for a delay. The government motion for Thursday's vote said that if MPs backed May's Brexit deal in a third vote before March 20 -- the day before an EU summit -- then she will ask for a short extension to allow for the treaty to be ratified. This will last until June 30. "If it (parliament) is not willing to support a deal in the coming days, and as it is not willing to support leaving without a deal on 29 March, then it is suggesting that there will need to be a much longer extension," May said. Speaking ahead of the vote, German Chancellor Angela Merkel said: "Achieving an orderly exit together, and I particularly want to repeat this today, remains in our mutual interest." French President Emmanuel Macron also warned again that the deal on the table was "not negotiable". "We cannot renegotiate an accord that we negotiated over several months and which we have said is not renegotiable," he said.